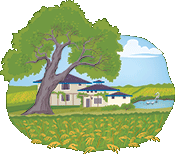 Massa Organics is a small family farm located along the Sacramento River near Chico, California. Using sustainable, ecologically-mindful practices, we produce organic, diverse, nutrient-rich crops. Tasty Massa Organics brown rice instead of boring white bread stuffing. Crisp apples compliment the nutty flavor of the brown rice. Prepare rice according to package directions, using 3 1/4 cup apple juice for the liquid. Cook diced apple, chopped onion, sliced celery, raisins, poultry seasoning, thyme, and pepper in butter in a large skillet until the vegetables are tender-crisp. Stir in the cooked brown rice, bran, slivered almonds, and remaining apple juice. Use as stuffing for poultry or pork roast, or bake at 350 degrees for 35 minutes. Massa Organics photography graciously provided by Jessica Lifland and Brie Mazurek. Additional photography by Rick Krach, Raquel, and Greg. All rights reserved. Are you a champion of local food, interested in organic farming, or simply fond of cute animal videos?